January 19, Friday -- Meeting. Montpelier. 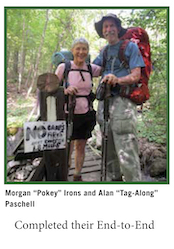 Come to look and listen to Montpelier Section members Lexi and Linnaea Shear, mother and daughter, slideshow on their LT End-to-End hike this past summer. T.W. Wood Gallery & Art Center in Montpelier, 7:00 P.M.
January 20, Saturday -- Snowshoe. Worcester. Moderate. 5.2 miles. White Rock Mountain. Start at the Hunger Mountain trailhead in Worcester, and hike up to White Rock Mountain, returning on the same trail. We will use snowshoes or microspikes depending upon conditions. Leader: Steve and Heather Bailey. January 25, Thursday -- Cross-country Ski. Stowe. Moderate to Difficult. 6 miles. Barnes Camp over Smugglers' Notch on the highway to Jeffersonville. Metal edged skis are not required, but helpful if the snow is hard packed. Leader: Steve and Heather Bailey. February 3, Saturday -- Snowshoe. Stowe. Moderate. 3.6 miles. Stowe Pinnacle. Beautiful views of Mansfield and the Green Mountains. Hike will be followed by optional lunch in Waterbury or Stowe. We will use snowshoes or microspikes depending upon conditions. Leader: Steve and Heather Bailey. February 10, Saturday -- Snowshoe. Waterville. Moderate. 4 miles. Laraway Mountain via LTN. From the Codding Hollow trailhead, we'll snowshoe to the ice formations and Lamoille Valley overview, returning the same way. Crampons may be preferable depending on trail conditions. Leader: Morgan Irons. April 28, Saturday - Meeting. Montpelier. GMC Montpelier Section Annual Meeting. Meeting packet. June 1, Friday - YAC Walk. Waterbury. Easy. GMC Headquarters. 1.5 miles. We'll walk the trails behind the headquarters, visit a historic shelter, and have time for a picnic! Meet at 10:00 A.M. Leader: Sharon Plumb. June 6, Wednesday - Bike Ride. Orange. Difficult. 20 +/- miles. Reservoir Rd. to East Hill Rd. to Cameron Rd. to Plainfield. Lunch at Positive Pie. Return via Brook Rd. and Reservoir Rd. Leave at 10:00 A.M. at the Orange Recreation Area just up Reservoir Rd. from Rte. 302. Helmet required. Leader: George Plumb. June 8, Friday - YAC. Plainfield. Moderate. Spruce Mountain. 4.2 miles. Meet at 10 A.M. A great little hike with a beaver pond and caves to explore and a rewarding view with a fire tower at the top. Even if you don't make it all the way with your little one, we'll have fun along the way! Leader: Sharon Plumb. June 12, Tuesday - Bike Ride. Montpelier. Easy. 13 +/- miles. Montpelier to Adamant. County Road to Bliss Pond Rd. to Adamant Rd. to Center St. to Bliss Rd. to County Rd., although we could decide to go further. Lunch at the Adamant Coop. Leave from Morse Farm at 10:00 A.M. Leader: George Plumb. June 14, Thursday - Paddle. Waterbury. Moderate. Kayaking at Waterbury Reservoir. Enjoy a relaxing paddle, observing whatever birds and other wildlife we may encounter. We'll spend approximately two hours paddling on this large, lovely body of water. Bring: Kayak, paddle, PFD, water, hat, sunglasses, snack, jacket. Meet at Department of Labor parking lot at 2:15 P.M.; return about 6:00. Leaders: Anne Ferguson and Nancy Schulz. Joint outing with Montpelier Senior Activity Center. June 15, Friday - YAC Stowe. Easy. Bring your little ones and their bikes, or your bike and bike trailer, and we'll explore the bike path along the river. The only goal is to have fun and get outside! Leader: Sharon Plumb. June 16, Saturday - Hike. Peacham. Easy. 4 to 5 miles. Hike from near Martin's Pond to Peacham Bog in Groton State Forest and see bog plants including pitcher plants, labrador tea, and cotton grass, and woodland flowers including lady's slippers. Optional hike on loop trail to Devil's Hill Mountain for a view of Peacham Bog and Peacham Pond. Bring water, lunch and snack. Leader: Phyllis Rubenstein. June 20, Wednesday - Bike Ride. Middlesex. Moderately Difficult. 18 +/- miles. Middlesex back roads. Rte. 2 to Brook Rd. in Middlesex, to Middlesex Ctr., to East Hill Rd. to Upper Terrace St., to Terrace St., to State St. and back to the Dept. of Labor. Bring lunch. Meet at Dept. of Labor at 10:00 A.M. Leader: George Plumb. June 25, Monday - Paddle. Middlesex. Easy. 3 hours. Paddle Wrightsville Reservoir in the late afternoon/early evening and see beavers, herons, and other wildlife. Optional swim. Distance depends on weather, water level, and the abilities of the group. Must have PFD and your own canoe/kayak. Bring water and dinner or snack. Leader: Phyllis Rubenstein. June 29, Friday - Bike Ride. Waterbury. Easy. 20 +/- miles. Montpelier to Waterbury. Strawberry Festival at the Waterbury Congregational Church. Great food! Leave at 4:00 P.M. from the parking area behind the Dept. of Labor. Helmet required. Leader: George Plumb. July 1, Sunday - Hike. Windsor. Moderate. 5.4 miles. Mt. Ascutney. Hike to the summit via the Windsor Trail. Bring lunch and water. Leader: Michael Chernick. Cancelled on account of the heat. Rescheduling at a later date is a possibility. July 5, Thursday - Paddle. Groton. Moderate. Enjoy a relaxing paddle to a cascade at the southern end of Lake Groton, in Groton State Park. We'll take out there to stretch our legs and enjoy a snack before we follow the opposite shoreline for the return trip. We'll spend approximately two hours paddling with a break in the middle. Bring: Kayak, paddle, PFD, water, hat, sunglasses, snack, jacket, Green Mountain Passport (or money for state park admission), swimsuit (optional) Meet at Department of Labor parking lot at 1:00 P.M.; return about 6:15. Leaders: Anne Ferguson and Nancy Schulz. Joint outing with Montpelier Senior Activity Center. July 7, Saturday - Hike. Bolton. Moderate. Ridge running in Bolton Valley. Starting at the Bolton Valley access road we will hike past Bolton Lodge and climb the Beaver Pond ski trail to Buchanan Shelter on Oxbow Ridge. We will then follow the new Long Trail south for 6.5 miles along the ridgeline (all downhill!) to Stimson Mountain, Rt. 2 and the new Winooski River footbridge. The total hiking distance is an easy 8.5 miles. Meet at the MHS parking lot at 8:30. Leader: John Page. July 9, Monday - Paddle. Marshfield. Easy. 3 hours. Paddle Molly's Falls Pond (Marshfield Reservoir) in the late afternoon/early evening. Distance depends on weather, water level, and the abilities of the group. Optional swim. Must have PFD and your own canoe/kayak. Bring water and dinner or snack. Leader: Phyllis Rubenstein. July 11, Wednesday - Paddle. Hyde Park. Easy. 4-8 miles. Green River Reservoir, one of the most scenic areas in Vermont! Distance depends on weather and abilities of the group. Must have PFD and your own canoe/kayak. Leaders: Steve and Heather Bailey. July 11, Wednesday - Bike Ride. Johnson. Bike the well-maintained, scenic Lamoille Valley Rail Trail from Johnson to Jeffersonville and back. From Johnson, we'll bike approximately 10 miles to the covered bridge in Jeffersonville where we'll have our bag lunches overlooking the Lamoille River. After lunch, we'll check out "downtown" Jeffersonville before returning to our starting point. Total bicycling distance: approx. 20 miles. Bring: Bicycle, helmet, spare tube, sunglasses, jacket; bag lunch, snacks, and water. Meet at Department of Labor parking lot at 9:15 A.M.; return about 3:30. Leaders: Anne Ferguson and Nancy Schulz. Joint outing with Montpelier Senior Activity Center. July 14, Saturday - Hike. Eden. Moderate. 6 miles. Hike the LT and Babcock Trail near Eden, just south of Belvidere Mt. Devil's Gulch requires climbing over a few boulders. Leaders: Steve and Heather Bailey. July 18, Wednesday - Bike Ride. Calais. Easy. East Montpelier/Calais Back Roads. 20 +/- miles. Leave 10 A.M. from the parking area at No. 10 Pond in Calais. Bring a lunch as there is no place to buy lunch. Helmet required. Leader: George Plumb. July 21, Saturday - Hike. Victory. Moderate. 5.5 miles. Tentative: Subject to change. Hike in the Victory Basin Wildlife Management Area from the Damon's Crossing parking area along an old railroad bed and logging roads, passing wetlands, beaver ponds and softwood stands, to Bog Pond, where there is an old dam and mill site. Distance depends on the trail conditions (may be very wet due to beaver activity). Bring water, lunch and snack. Leader: Phyllis Rubenstein. July 29, Sunday - Paddle Walk. Groton. Easy. Osmore Pond. Various distances. Walk or Canoe, Kayak. Bring a poem to share. PFD required if paddling. Leaders: George Longenecker or Cynthia Martin. July 31, Tuesday - Bike Ride. Morrisville. Moderate. 30-35 miles. Bike on the Lamoille Valley Rail Trail. Bring lunch and water. Helmet required. Leader: Mary Garcia. August 1, Wednesday - Bike Ride. Orange. Difficult. 30 +/- miles. Orange to Groton via Rte. 302. We may take a side dirt road part of the way. A great ice cream place in Groton. Meet at the Orange Heights rest area on the left on Rte. 302. Helment required. Leader: George Plumb. August 6, Monday - Paddle. Stowe. Easy. 3 hours. Little River and the Waterbury Reservoir from the boat launch access on Cotton Brook Road (off of Moscow Road) in the late afternoon/early evening. Optional swim. Distance depends on weather, water level, and the abilities of the group. Must have PFD and your own canoe/kayak. Bring water and dinner or snack. Leader: Phyllis Rubenstein. August 8, Wednesday - Bike Ride. East Montpelier. Easy. 30 mile round trip. Cross VT Trail. Meet at the East Montpelier park and ride opposite the Washington Electric Coop at 9:30 A.M. We will then drive to Marshfield, take the Upper Road to the railroad bed and park near the bed. We will bike the bed down toward Groton village and stop for lunch at a scenic spot. We will then turn around and bike back. A beautiful forest covered trail using the old railroad bed. Bring lunch. Helmet required. Leader: George Plumb. August 11, Saturday - Trail Magic Day. Duxbury. GMC organized this first Long Trail Day as more than a dozen hikes throughout the LT. Andrew and Reidun Nuquist organized our Section's Trail Magic Day as a continuation from previous years. August 19, Sunday - Hike. Eden. Difficult. 5.6 miles. Mt. Belvidere on Long Trail from Rte. 118 trailhead parking lot in Eden. Long-range views of two countries and three states from historic fire tower on the summit. Bring lunch and water. Leaders: Steve or Heather Bailey. August 28, Tuesday - Bike Ride. Berlin. Moderate. 25 miles. Berlin Pond to Brookfield Floating Bridge. Bring lunch and water. Helmet required. Leader: Mary Garcia. Cancelled due to weather. September 1, Saturday - Bike Ride. Moretown. Moderate. Moretown to Warren. 25 mile loop using hilly, unpaved back roads on the way to Warren, and Rte. 100 on the return. Lunch at the Warren General Store. Helmet required. Bring water. Leader: Nancy Schulz. September 4, Tuesday - Bike Ride. Orange. Difficult. Orange to Plainfield. 20+ miles. Reservoir Rd. to East Hill Rd. to Cameron Rd. to Plainfield. Helmet required. Bring water. Lunch at Positive Pie. Return via Brook Rd. and Reservoir Rd. Leave at 10:00 A.M. at the Orange Recreation Area just up Reservoir Rd. from Rte. 302. Leader: George Plumb. September 8, Saturday - Paddle. Hyde Park. Moderate. Green River Reservoir. Canoe or Kayak and possible swim. Must have your own boat and PFD. Bring water, lunch, and snacks. Leader: Phyllis Rubenstein. September 11, Tuesday - Bike Ride. West Danville. Moderate. 16+/- miles. West Danville to St. Johnsbury on the Lamoille Valley Rail Trail. Helmet required. Bring water. Very scenic and some of it is like riding in a tunnel. Leave at the old railroad station in West Danville at 10:30 A.M. Lunch in St. Johnsbury. We will also meet at 9:30 at the East Montpelier Park and Ride to car pool. Leader: George Plumb. September 15, Saturday - Hike. Middlesex. Moderate. Middlesex Town Forest. Explore new trails being developed in this scenic area. Bring water. Leaders: George Longenecker or Cynthia Martin. September 16, Sunday - Hike. Lemington. Moderate. 5 miles. Mt. Monadnock. Enjoy fantastic views from the summit forest tower. Bring food and liquid for a day's hike. Leader: Michael Chernick. September 19, Wednesday - Bike Ride. Northfield. Moderate. 35+/- miles. Randolph Loop. Helmet required. Bring water and lunch. Leaders: Mary Smith, 505-0603 or Mary Garcia. September 20, Thursday - Paddle. Greensboro. Moderate. 3 hours. Caspian Lake with optional dinner stop afterwards at Positive Pie in Hardwick. Bring water. PFD required. Leader: Nancy Schulz. September 20, Thursday - Hike. Elmore. Easy. 3.7 mile loop. Mt. Elmore. Up the Fire Tower Trail to the summit and tower, descend on the Balancing Rock and the Ridge Trails. Bring water. Leader: Morgan Irons. This event was originally scheduled for Wednesday 19 September. September 22, Saturday - Hike. Barre Town. Easy. 6 miles. Millstone Quarries. These historic quarries contain some of the finest autumn scenery in the area. Bring water. Leaders: Steve or Heather Bailey. September 23, Sunday - Hike. Warren. Moderate. 5.2 miles round trip. Mt. Abraham via the LT from Lincoln Gap. 1,600' elevation gain. Bring water. Leaders: Steve or Heather Bailey. September 25, Tuesday - Bike Ride. Washington. Moderate. 12+/- miles. Bring water. Helmet required. Meet at the home of George Plumb, 305 Plumb Rd., Washington, at 10:00 A.M. Bike back roads, including Class 4 roads with some neat historic sites and interesting views. Lunch at Dixies in Chelsea and then return home by other roads but none back-country. Leader: George Plumb. September 26, Wednesday - Meeting. Montpelier. Executive Committee regular quarterly meeting. Members are welcome. 7:00 P.M. You may bring a dessert to share. September 29, Saturday - Hike. Duxbury. Moderate. 7.4 miles. Moderate distance and pace. Camel's Hump. Hike a loop from Duxbury trailhead (Dean Trail to Long Trail to Monroe Trail). May see early fall colors. Bring water, lunch and snacks and wear clothes appropriate for the weather. Leader: Phyllis Rubenstein. September 29, Saturday - Hike. Hubbardton. Moderate. Taconic Mountain Ramble, the newest jewel in the VT state park system. Approximately five miles of trails, meadows, vistas, and waterfalls will be explored on this moderately difficult hiking trip. A Japanese garden is one of the highlights. The park has no facilities so it's important to bring plenty of water along with lunch. Bring a Green Mountain Passport, if you have one, for a possible visit to Hubbarton Battlefield (located next door.) Driving time is 1 hr. 45 min each way. Leaders: Kevin Ryan and Nancy Schulz. October 3, Wednesday - Hike. Stowe. Easy. 1.5 miles. Easy distance with a moderate climb. New Barnes Camp Loop on the Long Trail, Stowe. If there is interest, we may also hike the new section of the LT heading up Mt. Mansfield, or go to Sterling Pond. Meet at the Dept. of Labor at 9:00 A.M. or 10:00 A.M. at the new LT parking lot across from Barnes Camp. Bring water. Leader: Charlene Bohl. October 6, Saturday - Hike. Middlesex. 11.8 mile loop. Difficult ascent and descent, Moderate crossover. Hunger & Worcester Mountains. Bring lunch and water. We'll spot a car in Worcester, then drive to North Bear Swamp Road in Middlesex, climb the Middlesex Trail to the summit of Mt. Hunger, follow the Worcester Range ridgeline on the Skyline Trail to the summit of Mt. Worcester, and descend the Worcester Mountain Trail. Leader: Morgan Irons. October 10, Wednesday - Bike Ride. Stowe. Moderate. 20-25 miles. Moss Glenn Falls to Morrisville and return on Randolph Road. Helmet required. Bring water. Plan to have lunch at the Bakery in Morrisville. Leaders: Mary Smith, 505-0603 or Mary Garcia. October 13, Saturday - Work Hike. Stowe. Rain Date: October 14, Sunday. All abilities needed and welcomed. Various distances. LT north from Barnes Camp and Smugglers' Notch, Sterling Pond, and trail around Sterling Pond. Bring lunch and water. Wear sturdy boots, work clothes and gloves. Tools supplied. Meet at MHS at 8:00 A.M. Leader: John Buddington. October 20, Saturday - Work Hike. Duxbury. Rain Date: October 21, Sunday. All abilities needed and are welcomed. Various distances. From the new Winooski River footbridge, work on LT south to Bamforth Ridge Shelter. Bring lunch and water. Wear sturdy boots, work clothes and gloves. Tools supplied. Meet at MHS at 8:00 A.M. Leader: Alan Paschell. October 22, Monday - Paddle. Chittenden. Moderate. 3+ hrs. on the water. Chittenden Reservoir. Bring PFD and bag lunch. Leader: Nancy Schulz. October 24, Wednesday - Bike Ride. Montpelier. Moderate. 26 miles. Bike to Waterbury via Stevens Brook Road, and return on Rte. 2. Helmet required. Bring water and lunch or buy in Waterbury. Leaders: Mary Smith, 505-0603 or Mary Garcia. October 27, Saturday - Hike. Underhill Center. Difficult. 6.1 mile loop. Butler Lodge. From the Stevensville Road in Underhill Center, ascend the Butler Lodge Trail (some difficult sections), take the Wallace Cutoff, and descend via the LTS (moderate) and Nebraska Notch Trail (easy). Leader: Morgan Irons. October 30, Tuesday - Bike Ride. Washington. Moderate. 10+/- miles. Circular loop around the ridge behind George's home and return. Bring water. Helmet required. Leave at 10:00 A.M. from his home and return about 12:30 P.M., where lunch will be provided as a token of gratitude for going on the trips. Also hike up the ridge that we just biked around. Be sure to bring long pants to help prevent tick bites. Must Call Leader: George Plumb. November 3, Saturday - Walk. Calais. Easy. 5+/- miles. Number 10 Pond to Cranberry Meadow Road and back. See petroglyph, possibly migrating waterfowl. Bring water, lunch and snacks. Leader: Phyllis Rubenstein. November 5, Monday - Hike. Plainfield. Moderate. 7+ miles round trip. Seyon Lodge State Park in Groton from base of Spruce Mountain in Plainfield. Rolling terrain, wet in places. Bring bag lunch and water. Leader: Nancy Schulz. November 7, Wednesday - Hike. Waterbury. Moderate. 7+/- miles. Perry Hill network of trails in Waterbury. Rolling terrain with steep sections and some narrow bridge crossings. Bring water and bag lunch. Leader: Nancy Schulz. November 10, Saturday - Walk. Stowe. Easy. 3-5 miles. Enjoy a fall walk on the bike path. Plan to have lunch at McCarthy's. Leaders: Mary Smith, 505-0603 or Mary Garcia. November 15, Thursday - Meeting. Montpelier. General membership meeting. 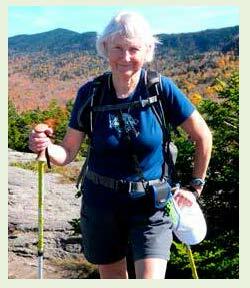 Phyllis Rubenstein presents "The Walker's Haute Route: From Chamonix to Zermatt" -- a talk about her 120 mile hike in the French and Swiss Alps. She will show photographs of the mountains, flora, and fauna, and discuss the challenges and wonders of hiking along this stunning alpine terrain. 7 p.m. at the T.W. Wood Gallery. December 1, Saturday - Cross-country Ski. Stowe. Moderate. 6 miles. Difficult Terrain. Ski from Barnes Camp over Smugglers' Notch on the highway (closed to vehicular traffic) to Jeffersonville. Experience required. Cross- country (classic or skate) skis required. If there is enough snow on the road, we'll be skiing with the area high school and college cross-country ski teams. If there is not enough snow, leader will move event to another location. Bring water, snacks, and lunch. Leader: Phyllis Rubenstein.